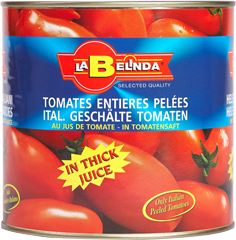 Morrisons Foodservices is proud to be a distributor of La Belinda Tomatoes in Scotland. They are processed in the region of Campania in Italy which is renound for producing top quality tomatoes. To obtain quality peeled and chopped tomatoes, the best Italian tomatoes are chosen from the South to the North, from the fields under Vesuvius to those of the Po Valley, from Puglia to Calabria. The tomatoes are processed from fresh and verified with the utmost care regarding all the norms of protection of quality and health, to bring the sweetness of true Italian tomatoes on the table. For better performance, the fruits which do not meet the standards of production are eliminated and with optical selectors the right level for the ripening of the tomato is established. 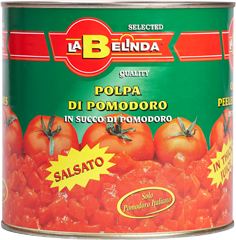 La belinda Tomatoes are perfect for making a tomato based sauce for pasta, pizza and many other dishes. The secret of a good sauce is a quality Italian tomato!